Rome founded the colony of Nemausus before 28 BC, in what now is southern France. It became the capital of the Narbonne province. We now call the city Nîmes. In the age of Augustus, 27 BC to 14 AD, it had a population of about 60,000 people. The city needed water. There was a large spring, the Fontaine d'Eure, about 20 kilometers away in a straight line. But the southernmost foothills of the Massif Central, the Garrigues de Nîmes, were in the way. A tunnel through them would have to be 8 to 10 kilometers long. The only practical route was a 50-kilometer loop around those foothills. The spring was only 17 meters higher than the repartition basin in Nemausus. But, with a very carefully designed and built aqueduct, this would work. The average gradient would be about 1 in 2,900. However, the aqueduct would have to cross the Gardon river, and a constant gradient would make that crossing inconveniently high. The Romans designed an aqueduct with a relatively steep gradient of 1:1493 or 0.67 meters per kilometer from the spring to the river crossing. It could then cross the river on an aqueduct bridge almost 50 meters above the river. This was unusually high compared to other Roman aqueducts. The rest of the way to Nemausus, the aqueduct would drop at the shallow rate of 1:4167, or just 6 meters over the remaining 25 kilometers. For one section, the descent was down to just 1:14,286, or 7 millimeters per 100 meters. The resulting design made the aqueduct bridge 360 meters long, 48.8 meters above the mean water level in the river. The water course drops just 2.5 centimeters along its length, for a gradient of just 1 in 18,241. Historians estimate that a crew of 800 to 1,000 workers built the aqueduct bridge, now known as the Pont du Gard, during a 15-year period between 40 and 60 AD. 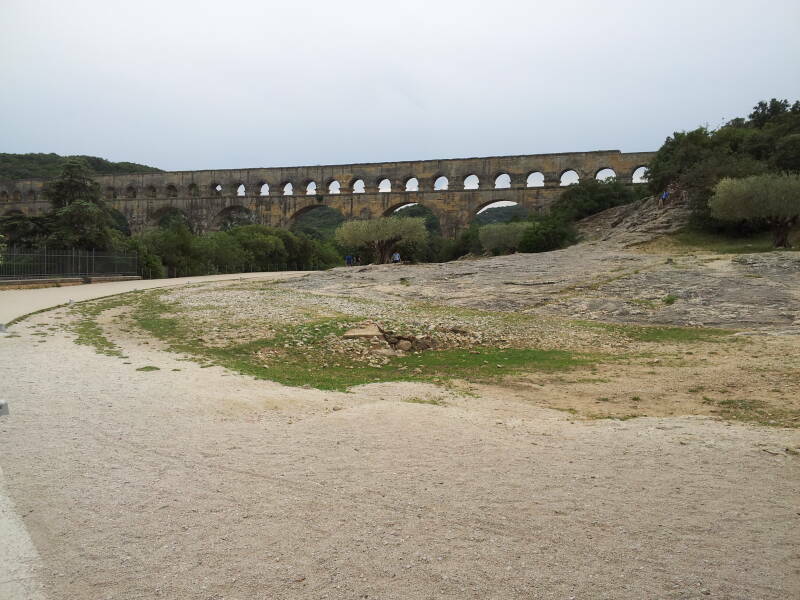 The aqueduct carried about 40,000 cubic meters of water to the city every day. Water took about 27 hours to flow from the spring to the city. It arrived at the castellum divisorum, a shallow, open basin about 5.5 meters in diameter and 1 meter deep. From there it flowed on into the city's main water pipes and supplied drinking water, baths, and fountains. Waves of invaders started passing through the area in the 4th century, and the aqueduct was largely abandoned. There was no more maintenance. Dissolved calcium carbonate or CaCO3 precipitated out of the water along the way, producing deposits. Vegetation grew in through the stone lid covering the channel along most of its route. There were no longer any circitores, maintenance workers who cleaned the aqueduct as they crawled through it. It probably went out of use in the 6th century, although some sections may have remained somewhat useful as late as the 9th century. The King of France granted the right to charge a crossing toll to the seigneurs of Uzès in the 13th century. They added the adjacent road bridge in the 18th century. It was mostly constructed without either mortar or clamps. The blocks were carefully cut to fit together and stay in place through friction alone. Most of the blocks were cut in a quarry about 700 meters down the river. Many of them were numbered and labeled for the workers assembling the bridge: fronte sinistra, and fronte dextra, and so on. The Pont du Gard has attracted visitors for centuries. Apprentice masons visited to learn Roman stone-cutting techniques. 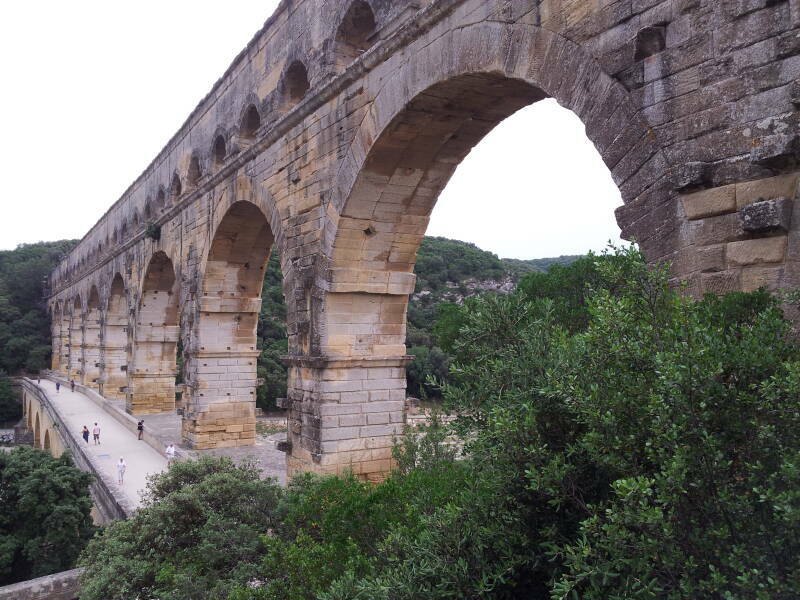 Starting in the 18th century, the Pont du Gard became a stop for travelers on the Grand Tour. Now a nearby museum displays other Roman hydraulic engineering. 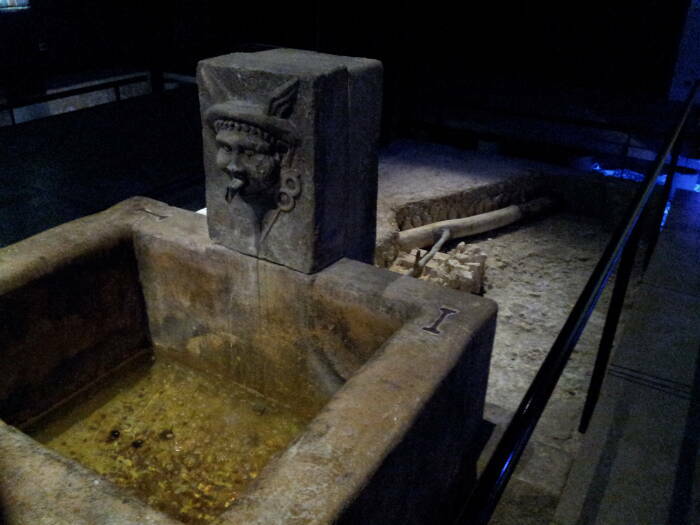 Here is a small fountain, and some excavated Roman plumbing. 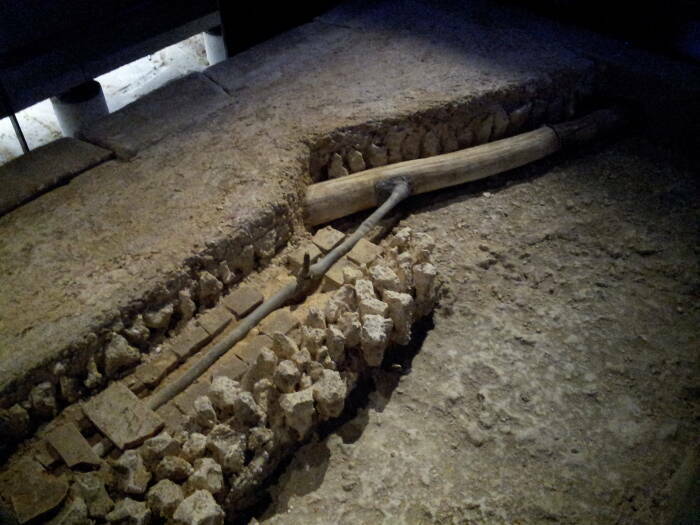 Roman pipes are literally plumbing, as the pipes were made from plumbum, what we now call "lead". A "plumber", a job title dating back to the Roman Empire, is someone who plumbs, who works with lead pipes. Most Roman water supplies had enough dissolved calcium carbonate or CaCO3 precipitating out of the water onto the inner surface of the pipe to quickly prevent water from contacting the lead itself. Unfortunately, the Romans also used lead cookware. They even added lead to food and drink, using it as a preservative in wine. Sextus Iulius Frontinus was a prominent Roman civil engineer and author of the late 1st century AD. He served as a general under Emperor Domitian, commanding forces in Roman Britain and on the Rhine and Danube frontiers. Frontinus is best known for his writing on Roman hydraulic engineering. Rogers' edition of his major work, Frontinus: De Aquaeductu Urbis Romae, has extensive commentary in English. Emperor Nerva appointed Frontinus as Curator Aquarum, Supervisor of the Aqueducts. 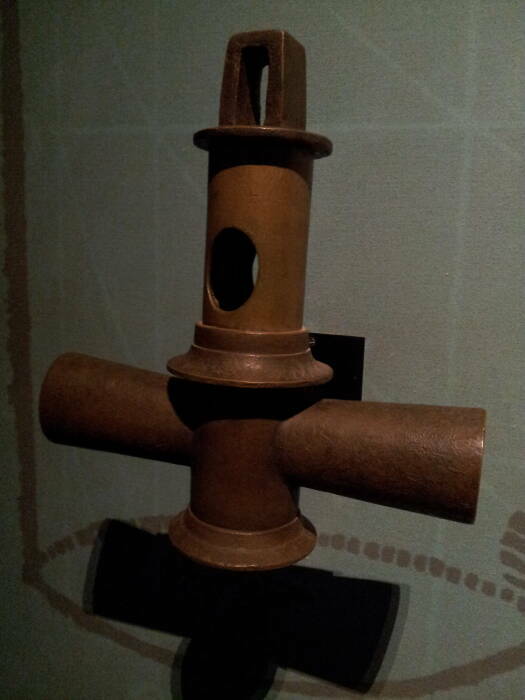 This 1st century faucet is similar to examples found at Pompeii. Frontinus described how smiths could produce parts to standardized designs, allowing replacement and repair. Faucet valves were the same across the Empire. 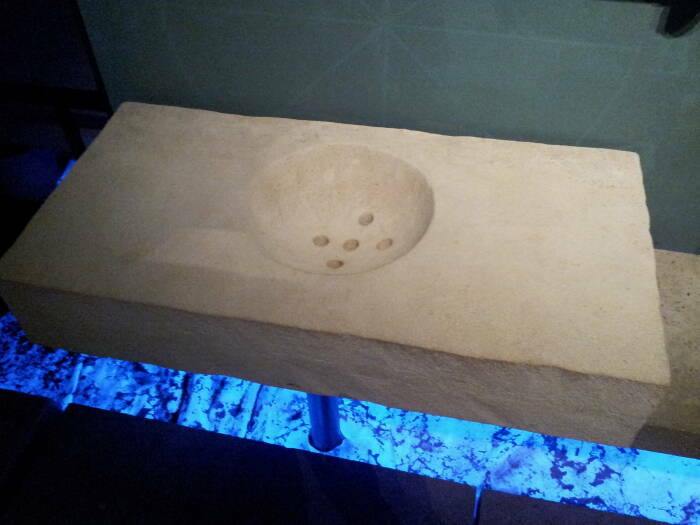 This is a marble flagstone that would have drained a street into the sewer. This one carried the overflow of water from the 1st-century triumphal fountain at Glanum. That's 20 kilometers south of Avignon, and just one kilometer south of Saint-Rémy-de-Provence. Glanum was close to Barbégal, the largest industrial facility known from antiquity. It was the primary water source for the city of Arelate, what we now call Arles. The mill complex at Barbégal was used at least through the 4th century. The area was inhabited into the Middle Ages, with a Carolingian era (early 800s) cemetery indicating a significant population nearby, and a diminishing habitation over the following centuries. 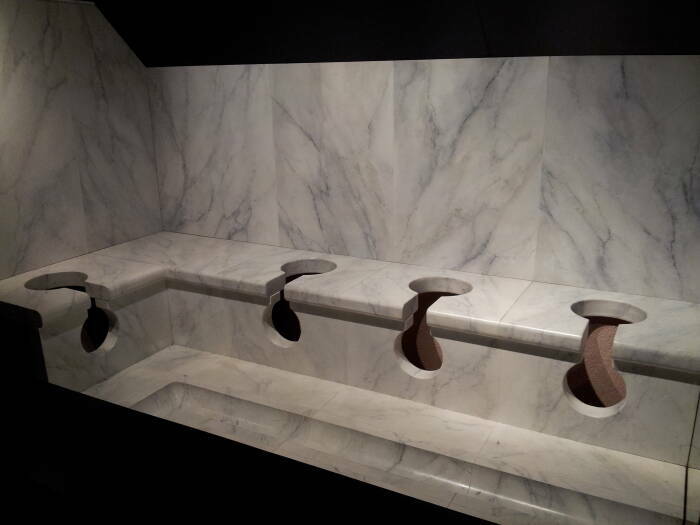 The museum has modern reconstruction of 1st century Roman toilets. Because, hey, everyone wants to see toilets! Single-seat toilets are latrinae, while multi-seat models like this are foricae. 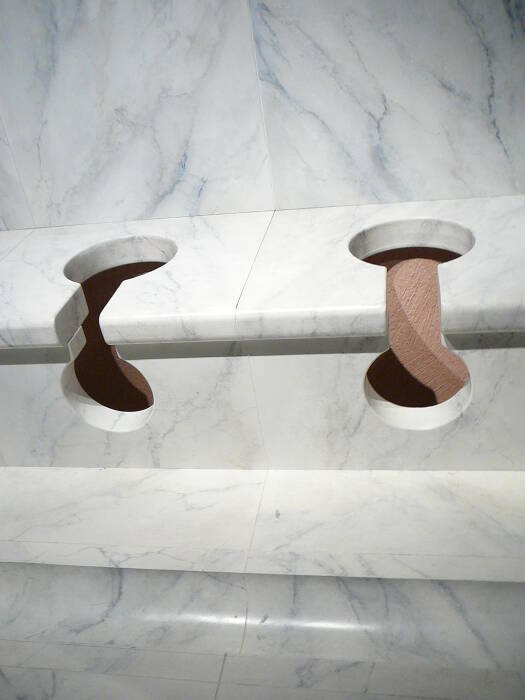 With the constant supply of water from the aqueduct, 40,000 cubic meters or 40 million liters per day, water could flow continuously through the discharge conduit below the seats. That would carry waste into the sewers. It would also help to draw air along the sewer, pulling fresh air into through the windows and doors, and down through the openings.